Lee Seul Bi (Kim Sae Ron) is an angel who is sent to Earth to look after Shin Woo Hyun (Nam Woo Hyun), who lives with his grandmother and carries emotional scars from being abandoned by his parents. Despite his cold demeanor, Woo Hyun is popular in school because of his good looks and singing ability. 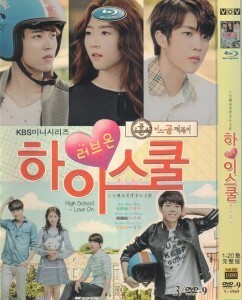 When his best friend, Hwang Sung Yeol (Lee Sung Yeol), finds out a secret that ties them together and also develops feelings for Seul Bi, who is posing as a fellow student at their school, the best friends turn into rivals. Can Seul Bi survive first love and other the perils of life as a teenager and properly do her job to protect Woo Hyun?